Born Oct 31 18921,2,4,5,6,7 , Stonefort, Saline County, Illinois1,2,4,5,6,7. Henshaw, May [unclear], sister, age 5, born [..unclear..] 1894 in Illinois; parents born in Illinois. 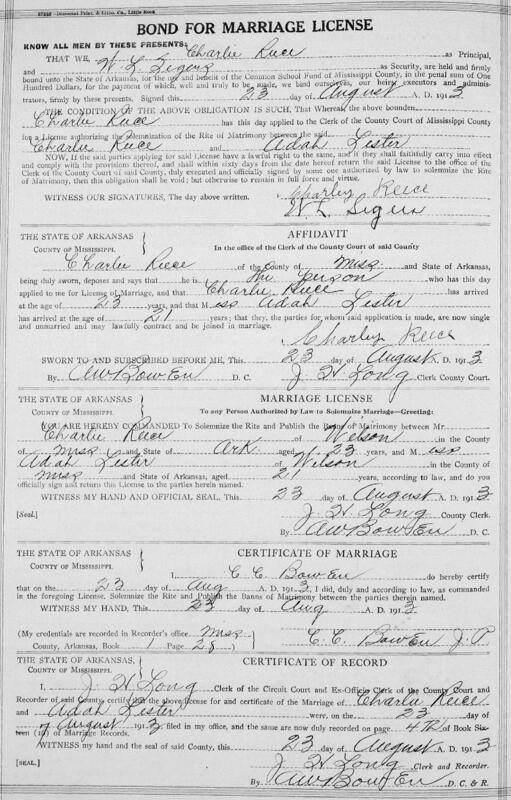 She then married Charles Calvin Reece, Aug 23 1913, Wilson, Mississippi County, Arkansas.1,2,3,9 Charles, son of James William Reece & Ollie B. Cannada/Canady2,4,5,6,7,10, was born Apr 8 18902,4,5,6,7,10 [Apr 8 189111], Trimble, Dyer County, Tennessee2,4,5,6,7,10. Reece, Chas. C., head-of-household, age 29, born in Tennessee; parents born in Tennessee; rented home; occupation: engineer, rail road. Reece, Ada, wife, age 27, born in Illinois; parents born in Illinois. 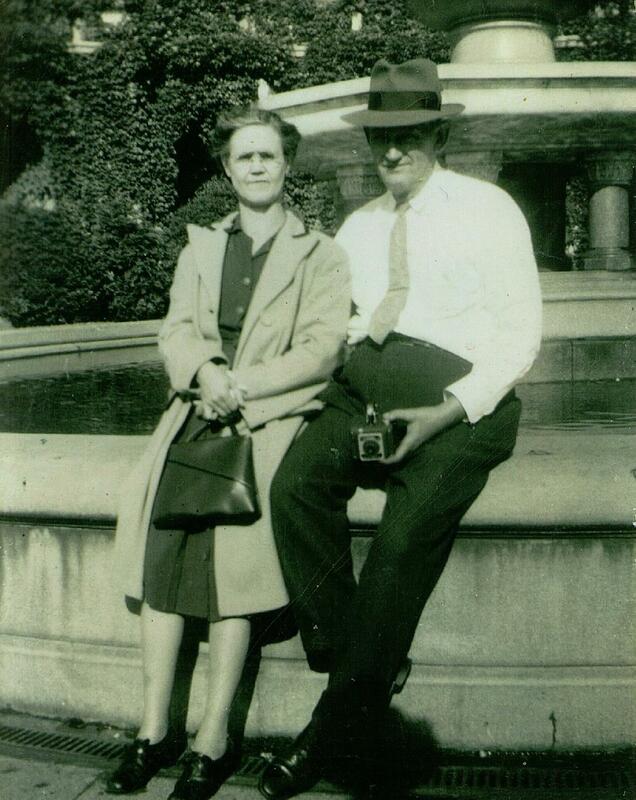 Reece, Dortha, daughter, age 1, born in Arkansas; father born in Tennessee; mother born in Illinois. Reece, Carl Lester, son, age 8, born in Arkansas; father born in Tennessee; mother born in Illinois; attended school. Reece, G.C., head-of-household, age 39, born in Tennessee; parents born in Tennessee; first married at age 23; rented home ($20.00 rent); no radio in home; occupation: engineer, Frisco Line; not a war veteran. Reece, Ada, wife, age 37, born in Illinois; parents born in Illinois; first married at age 21. Lester, Carl, son, age 19, born in Arkansas; father born in Tennessee; mother born in Illinois; occupation: surveyor, Lee Wilson Co.; not a war veteran. Reece, Mary E., daughter, age 9, born in Arkansas; father born in Tennessee; mother born in Illinois; attended school. Reece, Helen, daughter, age 7, born in Arkansas; father born in Tennessee; mother born in Illinois; attended school. Reece, Calvin, son, age 3 years 3 months, born in Arkansas; father born in Tennessee; mother born in Illinois. Reece, C.C., head-of-household, age 50, born in Tennessee; completed 4th grade; on Apr 1 1935 was living in rural Mississippi County, Arkansas; rented home ($12/month rent); occupation: derrick operator, junk yard; worked 47 weeks in 1939; $495 wages in 1939. Reece, Ada M., wife, age 47, born in Illinois; completed 8th grade; on Apr 1 1935 was living in rural Mississippi County, Arkansas. Reece, Charles Jr., son, age 13, born in Arkansas; completed 5th grade; on Apr 1 1935 was living in rural Mississippi County, Arkansas; attended school. Jordan, Mary E., daughter, age 19, born in Arkansas; completed 5th grade; on Apr 1 1935 was living in rural Mississippi County, Arkansas; widow; occupation: waitress, restaurant; worked 8 weeks in 1939; $64 wages in 1939. 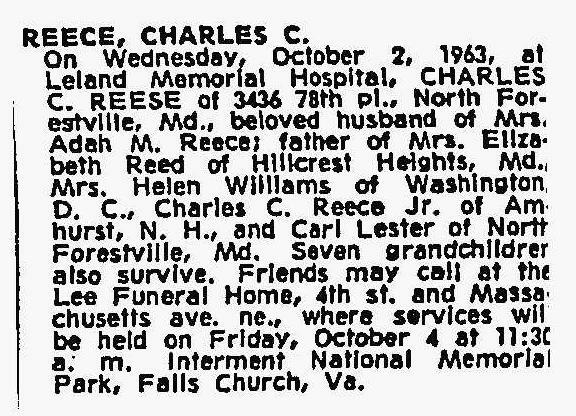 Charley's obituary was published in the "Washington Post" (Washington, D.C.) on October 3-4, 196317 (see scan below). 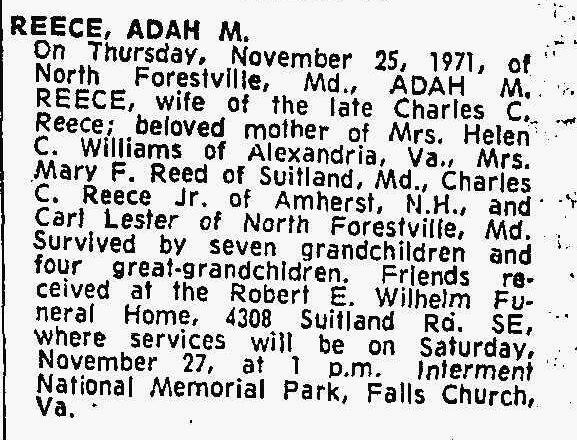 Adah's obituary was published in the "Washington Post" (Washington, D.C.) on November 26, 197118 (see scan below). Contribution from Sally Reece Muri (). Ancestry Family Tree data "Reece Muri Family Tree" posted by "saremu" (Sally Reece Muri). 1920 census, Wilson, Golden Lake Township, Mississippi County, Arkansas; roll T625-73, ED 156, page 1A, line #44, dwelling #11, family #12. 1930 census, Golden Lake Township, Mississippi County, Arkansas; roll T626-85, ED 24, page 1B, line #74, dwelling #14, family #15. 1940 census, Memphis, Shelby County, Tennessee; roll T627-3961, ED 98-42, page 1B, line #52, household #14. 1900 census, Stonefort, Saline Township, Williamson County, Illinois; roll T623-354, ED 122, page 1A, line #45, dwelling #11, family #12. "Washington Post" (Washington, D.C.), Oct 3-4 1963; http://www.ancestry.com. "Washington Post" (Washington, D.C.), Nov 26 1971; http://www.ancestry.com.